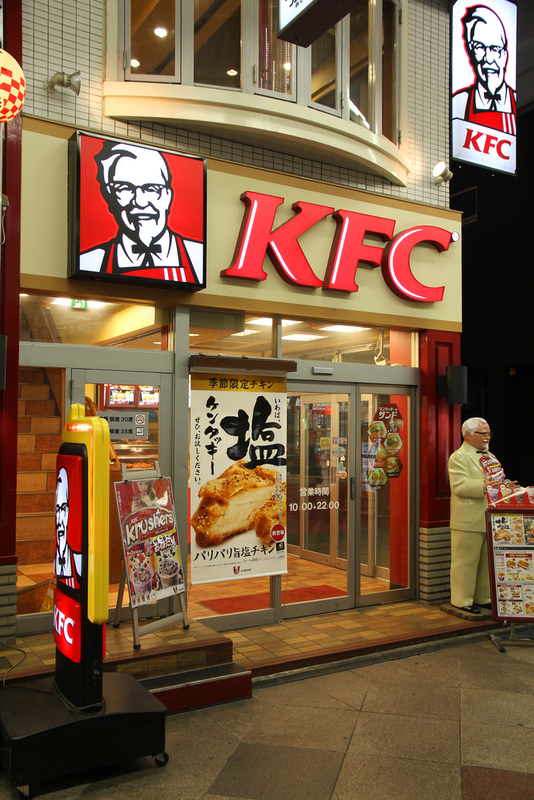 Rachel M. asks: Was Colonel Sanders really a Colonel? Luminaries such as Muhammad Ali, Jim Beam, Fred Astaire, Betty White, and Winston Churchill are among the eclectic mix of people who have been named a Kentucky Colonel. But there was one person who took the honor of “Colonel,” something he was actually awarded twice, and made it an essential part of his identity- the colorful, eccentric founder of the “Kentucky Fried Chicken Empire,” Colonel Sanders, who incidentally didn’t manage to create that empire until after the age when many are contemplating retirement. He didn’t really have that luxury at the time, being just about flat-broke at the age of 62. If the only way to success is through failure, Harland Sanders certainly earned his success. Born September 9, 1890 in Henryville, Indiana, Harland had a tough childhood. His father passed away when he was six and his mother had to work several jobs to make ends meet. So, he was tasked with looking after his two younger siblings and taking care of the home, which included cooking. It was said before the age of ten, Harland had mastered several regional dishes. He did just that and got sent to Cuba, where he was honorably discharged after only three months. He made his way to Alabama and over the next twenty plus years he worked at variety of jobs including railroad worker, insurance salesmen, country lawyer (where he was fired after assaulting his own client), Ohio River steamboat ferry operator, a tire salesmen, and secretary to the Chamber of Commerce in Columbus, Indiana. For six years, he was the operator of a gas station, his longest tenured job, before it was closed due to the Great Depression. In 1930, at the age of 40, broke, and having already failed several times in the work force, he made his way to Corbin, Kentucky where the Shell Oil Company agreed to allow him and his family to live at a recently built gas station. In exchange, a large percentage of sales was to be given back to Shell. As Sanders (not yet a Colonel) said himself in his autobiography, “Corbin was the only place I knew I could start again without any money, a place where business would be driving by my door 24 hours a day.” He was proud of his gas station, so proud in fact, that when challenged by a neighboring gas station worker (owned by Standard Oil), a shootout occurred. Sanders “gun blazing, emerged victorious.” Despite the fact that he’d shot the neighboring gas station worker, no charges were filed as the other man had shot first. Motorists passed through his station day and night, usually hungry. They would ask Sanders for recommendations, but soon he realized he should be the one providing the food for the hungry travelers. So, he cooked. He didn’t have a restaurant, so at first diners ate at his dining room table with his family. Soon, people from across the state came to visit solely for the hearty meal of steak, country ham, eggs, biscuits, and yes, fried chicken. Sanders called it “home meal replacement” – selling complete meals to busy, traveling, time-strapped families. He advertised it as a “Sunday Dinner, Seven Days a Week.” His gas station / cafe was doing so well, that he bought out the motel across the street and turned it into a 142-seat restaurant. Orders, especially for his chicken, piled up. Sanders needed to find a way to cook faster. That’s when he discovered a “new-fangled thing called a pressure cooker” at a local hardware store. In his autobiography, Sanders admitted that, contrary to what you may have heard elsewhere, he didn’t invent the pressure cooker, simply adapted it to fry a lot of chicken quickly. “Sanders Court and Cafe” became one of the most popular stops in Kentucky. For his fried chicken efforts, in 1935 the governor of Kentucky, Ruby Laffon (quite a character in his own right), bestowed Harland Sanders the title of Colonel “in recognition of his contributions to the state’s cuisine.” He would be commonly called “Colonel Sanders” from that point forward. Even after receiving that distinction, Colonel Sanders still had trouble keeping his business afloat. A fire in 1939 burned down the entire restaurant, but he rebuilt it. A year later, along with a new motor court, Sanders Court and Cafe was back on its feet and selling chicken like gangbusters to travelers making their way on US 25 – a major north/south route in America. Sanders was so well-like and well-respected that when he lost his official “Colonel” certificate, the state and Governor Lawrence Weatherby just decided to re-commission him in 1950. So, in truth, he was a Colonel twice over. In the early 1950s, the route of the new Interstate 70 was announced. Unfortunately, unlike US 25, it did not swing by Sanders Court and Cafe. Colonel Sanders was once again out of luck, but he realized that his future wasn’t tied to one restaurant, but many of them selling his chicken. So, at the age of 62, he sold his restaurant and motor court, barely making enough to pay off his bills and taxes, and hit the road with his recipe and pressure cooker. He drove from town to town, diner to diner, pleading with owners to use his delicious chicken recipe and give him a nickel commission on each piece sold. He slept in his car and was nearly broke… again. The first to accept Sanders’ offer was Pete Harmon, owner of the Do Drop Inn in Salt Lake City, Utah. With a handshake agreement in 1952, Salt Lake City became the first city with a Kentucky Fried Chicken franchise. By 1959, Sanders’ had made over 200 such deals in the US and Canada. It was also around this time when Colonel Sanders began dressing the part too. From the late 1950s until his death in 1980, Sanders wore a white suit, a string tie, and a snow white goatee. It was said he had two suits, one that was heavy wool for winter and a light cotton one for summer. Colonel Sanders was finally a permanent success. He sold the company in 1964 for $2 million (about $15 million today), but stayed on as a spokesman and the face of Kentucky Fried Chicken. He traveled across the country and the world talking chicken until the day he died at age of 90 in 1980. He’s buried in Louisville, Kentucky with a bust and an epitaph reading “Founder of Kentucky Fried Chicken Empire,” marking the spot. Colonel Sanders’ famous handwritten 11 herb and spice fried chicken recipe is still so highly valued that it is kept in a secured vault in KFC’s Lexington, Kentucky headquarters. “Something that was left out of this story that is very important. Colonel Saunders was a Mormon… as was Howard Hughes. Howard Hughes also had a germ neurosis. Colonel Saunders demonstrated that his cooking process and food handling ensured a safe product…from a germ contamination standpoint. “Howard Hughes liked the idea of having a food franchise that assured him of a safe food source wherever he travelled so he bankrolled the franchise expansion. In fact, it was a requirement in the early days that in order to be approved for franchise you had to be a “bishop” of the Mormon Church in your community! You will not find this documented anywhere. 11 herbs and spices ?? All it really was is salt, pepper and MSG. MSG wasn’t near as common back then as it is now. my family knew this man. he used herbs and spices. William Poundstone did a lab test for his book “Big Secrets”, he did not find eleven herbs and spices at all. Just four: flour, salt, monosodium glutamate (MSG), and black pepper. About 40 years ago my mom was in a hospital (or for you Brits: “In Hospital”) in the LA area. One night she wakes up when she feels someone slipping next to her in bed. Turning on the lights it was none other than the Col. himself who was in the room across the hall. He had gotten up in the middle of the night for stroll up and down the hallways and took a left when he needed to take a right. Corbin is located off of I-75, not I-70. Also, KFC headquarters is located in Louisville, KY not Lexington. I knew Colonel Harlan Sanders quite well. I used to eat dinner in his home located near Shelbyville, KY. And yes, we always had fried chicken along with ham! He was a character. I once met him at his home after a long trip to California. He had mustard all over the front of his white suit. He had eaten a hot dog on the way back. I did KFC commercials on TV with him along with hosting the March of Dimes (on Kentucky television). He was a STRONG advocate of this charity. He had trouble reading the teleprompter. The type was either too small, or it would roll too fast. He would mess it up and then spurt out a stream of foul language! He could really cuss! He is buried in Cave Hill Cemetery in Louisville next to my uncle. It is the most historic cemetery there with many famous celebrities interred. As the other poster said, it was I-75, not I-70, and the headquarters for KFC is in Louisville, not Lexington, located just off the Waterson Expressway. A nice colonial style, but modern, building, very much in the ‘old South’ architecture. Despite the fact that its early campaigning was problematic by today’s standards (“Spare me the pity parade!” says this crip), March of Dimes is a very important charity that can help to reduce conditions such as Spina Bifida and Cerebral Palsy. I’m impressed with Colonel Sanders that he chose to support it. So basically, he was a colonel, just an honorary one in the same way that someone with an honorary doctorate are entitled to call themselves doctor. “In the early 1950s, the route of the new Interstate 70 was announced” no, interstate 75. it runs north-south. I-70 is much further north from us and runs east-west. “KFC’s Lexington, Kentucky headquarters” no, headquarters are in Louisville.